David Germain… I find your review GRATING and Offensive to the Autism Community! I certainly never imaged my first post of 2012 to be like the one I am writing but sometimes, well sometimes you just got to step forward and call someone out. I only wish I had a way to really get this post to Mr. Germain. If anyone reads this and feels as strongly as I do and has a way to get this to him, please let me know. Newcomer Thomas Horn, the 13-year-old star who was cast after the filmmakers saw him on a “Jeopardy!” kids episode, is a mixed bag, holding his own among the adult actors but, through no fault of his own, forced to behave with excessive shrillness much of the time. That’s because his character, Oskar Schell, may or may not have Asperger’s syndrome, a mild form of autism (his medical tests, we’re told, were inconclusive). You make allowances in life for people you encounter with autism, but spending two hours with a fictional character possessing autistic qualities can be grating. Oh My God, did he just say he makes allowances in life for autistic people? How nice of him. And then he goes a step further and becomes even more offensive by saying that spending two hours with an autistic person can be grating! As if my son and all the others like him don’t have enough challenges in life now we have someone like Mr. Germain a so-called professional Associated Press Writer putting in writing that he finds autistic traits to be annoying.I am in shock. How did this review get published is what I want to know? I agree Michelle and could not have said it better myself! So here is what I ask of you, my readers. Please please re post this and Michelle’s post to everyone and everywhere. My hope is that if enough of us start sharing this, well someone important hopefully will see it. If nothing else I think that Mr. Germain owes the entire autism community an apology. We fight every day to break down walls and preconceived ideas about our loved ones. We do our best to ignore the dirty looks and nasty comments from onlookers who don’t see the whole picture. We wake up every day with the hope that today, today will be the day that my son or daughter, sister or brother… our loved ones, will be accepted, understood or at least tolerated by the world. Mr. Germain, how dare you insult my son and those like him. He may speak in monotone, have quirky behaviors and be sensitive to outside stimuli but he has more empathy and compassion then you obviously will ever have. An apology Mr. Germain is the least you can do. Below is a clip from the movie. I certainly don’t find the boy’s voice grating! In fact, he reminds me of someone special to me! When One Door Closes… Watch out for your nose! Hi I for one can’t wait to see the movie either. I was upset at his comments too when I read Michelle’s post and it hurt me deep in my heart and even as I write this it brings back memories of ignorance I have faced last year at school and the hurt is still very raw so I will leave it there for now but I do hope he sees how much he has hurt the aurism community worldwise!!!!!! This saddens me! I emailed the editor in the hopes that it will be removed. Our children have so much to deal with without this added hatred and discrimination. So sad that people still think this way! Thanks for the heads up on this. My sister just told me about the movie today. Hope I can find it in Austin. Hadn’t even heard about it. Wow! You ought to try spending hours with children who struggle, or even their parents who struggle to raise them. I am not only the parent of a child with Autism, but I work daily with families, helping Parents accepting their diagnosis, pointing them in the grueling direction of therapies, doctors, and tests they will now need to take part in. Let me tell you what I find “grating”, ignorant people who are so quick to judge, those who think that watching a film in a two hour period gives you any insight into the disability itself, inhumane comments which are not only judgmental but degrading. Mr. Germain, unfortunately you are not alone, and because of people like you? I have to work twice as hard to help parents feel they are not alone, because of people like you I have to work twice as hard to encourage parents to not care how society views them and stress their right to enjoy life despite others who are completely ignorant, because of people like you? I have raise my voice 100 times louder in order to be an advocate for not only my OWN child but hundreds of others who parents are tired of fighting and have no more ambition, those who have lost their faith in humanity, those who feel there will never be a chance to rest when it comes to fighting and defending their child. Parents who never have any time away- no dates- no luncheons- sometimes not even the ability to have a job. Parents who devote themselves, to their children wholly all while also being a spouse, and often parents to other children. You have no idea the fight that we have- in order to teach our children to talk, in order to teach our children that society may look at them different but their ‘gifts’ are a blessing. You try teaching a child to be proud of themselves with people like you running around and accusing any time spent with them to be ‘grating’. You make me sick to my stomach- but as I said- you are not alone- unfortunately you are more of a majority- the difference is- your comments are the ones that LEAD this society to follow in your footsteps. Walk a mile in another’s shoes before you start throwing around comments about something you think you know something about but in fact- are just another ignorant busy body running your mouth. BY the way- how many people who are on the spectrum do you think you just offended and made them feel less of themselves while they sit quietly in the shadows, Are you proud? Got goosebumps reading this and it brought a tear o my eye and made me so mad again! Here I am trying to calm down to go to sleep! Thank you and please post your letter you will use on my facebook page in case others want to use it! I want to make it as easy as possible to get people to email this guy! WOW… that is all I can say! How sad that so many people make public comments without educating themselves first. before I write an article i always do some research. I just don’t get it. Interesting that he found the voice “grating”. I’m a mother of three, one of whom is almost seven years old, and HE has a grating voice (professorial and prigish interspersed with odd sound effects and howler-monkey like screeches). He is “normal” for his age, from what I have seen of his schoolmates. My 5yo daughter whines when she’s tired, or hungry, or bored, or feeling unappreciated. My 2yo is developing both of their vocal habits, plus a few wildcard bonuses (yay). This Germain character apparently does not spend time with ANY children, because they all seem to have some vocal habit/idiosyncrasy that, after two hours, has become grating. Just wish that people would stop acting as though every quirk or symptom of a diagnosed disease/disability is unpleasant, merely because it comes along with the diagnosis. I am going to post about this today. I had read this interview the other day and was outraged, but really had not heard the boy’s voice very well until you posted this link. I don’t find this boy’s voice grating at all and it seems that maybe what this reporter needs is to spend the day with children who are autistic or have Asperger’s. Awareness is the only way people like this are going to change the way they feel…until then there words are just ignorant! I think the media has responsibility to report on subjects accurately. This movie critic’s comment has no factual base and first rule in writing is to have supportive comments. It is sad to see such comments as it retracks all education, awareness and research efforts done by so many in the autism / asperger’s community. Ethically this writer should be ashamed to spread such “hatred,” although not intended, it will be the intent, and April was Autism Awareness Month but it will long be forgotten yet this review will go on in “cyberspace” forever – and etched into people’s minds won’t be the powerful abilities of individuals on the autism spectrum but the grating effects of hanging around such individuals thanks to David Germain. Perhaps Mr. Germain needs a little information: The Group – Special Needs is the largest group of Minorities in the world and the only one that any of us can join at any time. In five seconds a car accident, a fall, a medical condition or something else can change the course of your life forever… you, Mr. Germain can become part of this group of Special Needs or whatever label where you will wish all you had was Asperger’s or Autism. Not to say that having Asperger’s or Autism is a bad thing. Again another point for you; please check as some of our biggest contributions, actors/actresses, business leaders etc….they are on the spectrum…grating or not they have given the world things that you use daily to do your job so be careful what you say. The individual on the autism spectrum has a powerful mind, has abilities that you and I will never have to perform, create and develop tomorrows next company, software, science or technology phase. This is something that not everybody can do, so just because you are sitting in a cubicle, writing reviews for movies…uh how is that going to impact my children’s future? Is that going to cure diseases? I am not belittling what you do, but think before you speak and realize that the world needs all people and minds to make it flow. Exactly what is wrong with the world being diverse…sounding a little late 1930’s early 40’s Germany to me. If we didn’t have these amazing minds we would lack innovation, have to steal everybody else’s technology and not know anything called freedom. Here all people are allowed the possibility of oppportunity, perhaps visiting some 3rd world countries or south america would be a good journey for you to see how awesome our country is, really tired of hearing how bad things are here – I’ve been all over and let me tell you, we are so blessed. Further, if we didn’t have the amazing parents who put in the long hours to build these amazing minds up – those on the spectrum, not saying I am one of them, like the ones on here who have blogs etc to educate people like you who don’t intend to undo all the amazing work researchers, teachers, advocates, non-profits and so many others are doing to spread awareness….but comments like yours do so much damage…that is all people remember instead of the important stuff. However I am a proud parent of a teenager on the spectrum, another child who works as an A.B.A. Therapist who was inspired by her sister’s condition and last child who has other issues. Do you know what A.B.A. Therapy is? 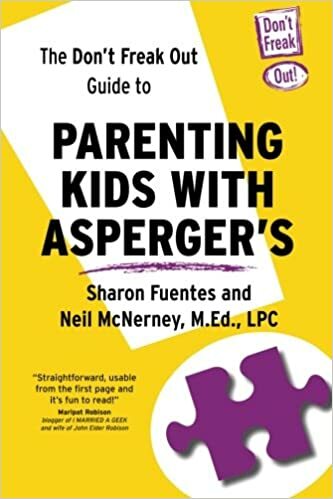 If you don’t, wow, again, seems to me you don’t know anything about Asperger’s or Autism yet more people are going to remember your comment and feel educated by you than all the efforts of so many. Please tell me this, exactly what are you going to do to educate your readers now on how much you actually don’t know and shouldn’t have written on this subject? How much time have you spent with a person on the spectrum? Was it only two hours? I really want to know because I want you to understand this is very prejudicial and the damage cannot be retracted but you can help by using your talent in a positive way. Exactly how many people do you know on the spectrum? Did you think about the person you were referring to? Did you think about the chance you could have a child or grandchild with some sort of challenge, not saying on autism spectrum, but something. Believe me, you would be all over this article if it pertained to your life, you need to think about these things and also take responsibility as a journalist and realize that if you don’t know what you are talking about then don’t report it. Did you talk to one person who was a professional in the Autism community to base your opinion on that people on the spectrum are found to be “grating?” Did you take a sampling poll? With all due respect, at least let your readers know the following: this is the writer’s opinion only. Oh but wait, then that may sound like you are mean, actually if you had just thought about it, there is no way you come out of this situation not sounding bad, so in looking out for your best interests, because that is all most people care about, I respectfully again suggest you read over what you write, think about what people will take from your review and ask if there is any personal bias in your article that doesn’t have facts to back it up pertaining to the movie. There was no mention in this movie of people with Asperger’s or Autism being “grating” to be around. I hope you have read all the comments on this post by an active parent who actually shares her life, experiences, happiness, and sadness in order to educate others. All of us do our part to make the world a better place. No matter what you do in the future, not just for Autism / Asperger’s please don’t make such damaging comments that really don’t add to your reviews anyway. In this particular case, it made you look bad and your was a distraction from the review. I agree with the reviewer, the movie was actually very dull, impenetrable and quite a trial to stick with, the shrillness of the child and twee-ness of the father /parent relationship was nice to begin with , but soon it too grated, the child (as is suggested in the movie) is on the spectrum, so what I think, he does what he does, he has impressive tenacity, but the pointlessness of what he tries to do throughout the movie leaves me floating as to where it is going. The aspie tag was something I was quite interested in seeing in this movie, and whilst there are some obvious signs, the movie itself was delivered, packaged and dropped on us in a very very poor fashion. I have an aspie son, we overcome, we never give up, we push forward and we redefine each and every of his original diagnosis we can we support, we advocate and we are tenacious in our belief that we SET the rules, not other people. We give movies like this very short lifespan. in short, a very poor movie to advocate the aspie/autistic position. I agree with the reviewer, and ignore his delivery which is what you should do, if that makes sense. I did it for my mum too, I am now 44 she is 65. Having spent her own life feeling inadequate, top of the class but failed her 11+ when sat in a strange place, it was due to other people’s negative opinions as to the reasons why that made her so unhappy. My diagnoses lead to her diagnosis and a true smile. I am now studying a BSc (Honours) in Psychology and Law with all the support the UK education system has to offer, because I now know to save others’ lives, meant I needed their bits of paper as proof. I never believed their criticisms and always knew. I only asked why to understand not to be defiant. Sadly, I did not know the damage it does to people when their ‘internal dialogues’ trust negative feedback. If that is the defiantness, they meant .Thank dog or whoever is in charge I missed that one. I can child whisper, but your insights make me realise I can old git (adult) whisper too. I have my own children now, who sadly society felt would be better off with their mother, as I could not explain why they wanted to live with dad, in their language. Compassion is worth so much more than the malleable love they call empathy. To say sorry to a snail when you stand on it, sadly is socially unacceptable. However, it is a genuine choice. Autism needs to be better understood by the general public. It disheartened me to read that a journalist would make such an ignorant comment. Thank you for setting Mr. Germain straight.